The ceremony recognized the best recordings, compositions, and artists of the eligibility year, which ran from October 1, 2017, to September 30, 2018. Nominations were announced on December 7, 2018. Dolly Parton was honored as the MusiCares Person of the Year two days prior to the Grammy Awards on February 8, 2019. Kendrick Lamar received the most nominations, with eight. Childish Gambino and Kacey Musgraves tied for the most wins of the night with four each. Nominations were to be announced on December 5, 2018, but were delayed to Friday, December 7, 2018 following the death and state funeral of former President George H.W. Bush. Miley Cyrus "In My Blood"
Janelle Monáe "Make Me Feel"
Red Hot Chili Peppers "Stay"
Chloe Flower "Money Bag (instrumental)"
Alicia Keys "Maple Leaf Rag"
Diana Ross "The Best Years of My Life"
Philip Bailey "Stop Trying to Be God"
"Knockin' on Your Screen Door"
"Blut und Boden (Blood and Soil)"
In the General Field (which comprises the awards for Record of the Year, Album of the Year, Song of the Year and Best New Artist), the number of nominees in each category was increased from five to eight. In the category of Best Compilation Soundtrack for Visual Media, music supervisors will now be eligible. The award for Best Surround Sound Album is being renamed Best Immersive Audio Album. On February 4, 2019, it was reported that American singer Ariana Grande would not be performing at or attending the Grammys, due to a dispute with producer Ken Ehrlich. On February 7, 2019, Grande made a public statement on the matter, she alleged that Ehrlich stifled her creativity and tried to stipulate what song she could perform. She then later went on and alleged that Ehrlich "lied" and she could "pull together a performance over night." On February 11, 2019, Trinidadian-American rapper Nicki Minaj backed up Grande and alleged Ehrilch "bullied" her. Minaj later said in a statement on Twitter: "I was bullied into staying quiet for 7 years out of fear. But I’ll tell my fans the REAL on the next episode of #QueenRadio they deserve the truth." ^ "TV Ratings Sunday: Grammy Awards down again year-to-year". Variety. February 24, 2019. Retrieved February 24, 2019. ^ Lewis, Randy. "The Grammy Awards return to Los Angeles in 2019". latimes.com. Retrieved August 28, 2018. ^ a b Aswad, Jem (July 17, 2018). "Recording Academy Announces Date, Deadlines for 2019 Grammy Awards". Retrieved August 28, 2018. ^ Brodsky, Rachel (January 15, 2019). "Alicia Keys to Host the 2019 Grammy Awards". GRAMMY.com. ^ Saad, Nardine (January 15, 2019). "Alicia Keys will host the 2019 Grammy Awards". Los Angeles Times. ^ "Dolly Parton Is MusiCares' 2019 Person Of The Year". Grammy.com. September 4, 2018. Retrieved September 15, 2018. ^ "Grammys 2019: Kacey Musgraves and Childish Gambino win big – as it happened". Guardian. 11 February 2019. Retrieved 14 February 2019. ^ "Grammy nominations 2019: Cardi B, Kendrick Lamar and Drake lead the pack". Guardian. 7 December 2018. Retrieved 14 February 2019. ^ "John Mayer, Meghan Trainor, Nina Dobrev and Leon Bridges are also on the list". Billboard. Retrieved February 7, 2018. 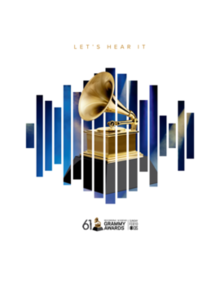 ^ "What's New For The 61st GRAMMY Awards?". June 26, 2018. Retrieved August 28, 2018. ^ Nickolai, Nate; Nickolai, Nate (2019-02-11). "Nicki Minaj Joins Ariana Grande in Calling Out Grammys Producer: 'I Was Bullied'". Variety. Retrieved 2019-02-12. ^ "'7 Rings' Co-Writer Tayla Parx 'Completely Understood' Why Ariana Grande Didn't Attend Grammys". PEOPLE.com. Retrieved 2019-02-12. ^ "Nicki Minaj Backs Ariana Grande, Calls Out Grammys Producer". HYPEBEAST. Retrieved 2019-02-12. This page was last edited on 16 April 2019, at 16:03 (UTC).